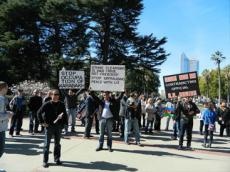 On Feb.23, 2012, the Azerbaijani-American community in California, led by Azerbaijani-American Council (AAC) and Northern Azerbaijan Cultural Society of America (NACSA), held a public rally at the California State Capitol, to protest against the Assembly Concurrent Resolution (ACR) 96 under consideration in the State Assembly. Introduced by Assemblymen Felipe Fuentes (D-CA), Katcho Achadjian (R-CA), and Mike Gatto (D-CA), ACR 96 seeks to designate February 27, 2012, as a so-called "California Day of Remembrance for the Massacres of Armenians in Sumgait, Kirovabad, and Baku”. Fueled by the Armenian-American special interest groups, ACR 96 attempts to force California lawmakers into assuming a one-sided position in the Armenian-Azerbaijani Nagorno-Karabakh conflict. While calling to honor (26) Armenian victims of the 1988 Sumgait riots on February 27, the resolution dissolutely ignores the Khojaly Massacre - a largest mass killing of the conflict according to Human Rights Watch - 20th anniversary of which is marked a day before, on February 26, 2012. On that day in 1992, Armenian forces attacked the Azerbaijani town of Khojaly and ruthlessly massacred 613 fleeing residents, including 106 women and 63 children. ACR 96 text refers to the so-called “Nagorno-Karabakh Republic”, an illegitimate client regime established by Armenia after ethnic cleansing on the occupied territories of Azerbaijan. The U.S. Department of State does not recognize the “Nagorno-Karabakh Republic” entity, therefore the wording of ACR 96 contradicts the official U.S. policy as formulated by the federal government. Furthermore, the resolution distorts the historical facts by claiming that the Nagorno-Karabakh region was "severed from Armenia and forced under Soviet Azerbaijan". According to a renowned Armenian historian, Richard G. Hovanissian of the University of California Los Angeles, in 1919, a year before the Soviet occupation of the Caucasus, the government of Armenian Republic acknowledged the sovereignty of Azerbaijan over Nagorno-Karabakh, as did the region’s ethnic Armenian inhabitants. So, on Thursday afternoon, Azerbaijani-American protesters gathered in front of the California State Capitol in Sacramento while both the Assembly and the Senate were in session. The protesters chanted slogans denouncing ACR 96, calling for California lawmakers' awareness of the upcoming 20th anniversary of Khojaly Massacre as well as of the ongoing occupation of Azerbaijani territories by Armenian armed forces.